The American Traditional tattoo design style originated in the 1930s on American military bases. It became associated more with sailors when tattooist Norman “Sailor Jerry” Collins popularized it. This style of tattooing is based on big and bold sections, with solid and clean black outlines and a minimal (mainly primary colors) well-saturated color palette. Traditional imagery is often maritime in nature, celebrations of love or reflections on love lost. American Traditional design styles use heavy black outlines with minimal color and a lot of black shades. They are usually darker in appearance and the color choice is limited to simple colors such as average blue, green, red and yellow. Colors are used in blocks with very few details. The American Traditional tattoo design is also being styled in such a standard way that everything they portray appears as a two-dimensional shape, without any three-dimensional depth. The American Traditional tattoo design style usually lacks a lot of complicity since it was done years ago with less advanced equipment and the tattoos were made fast at lower prices. The majority of traditional tattoo designs portray military and nautical motives and themes, as navy and army men were the primary tattoo clients. This design style preserved its popularity throughout the years, thanks to its historical significance, clearly readable simplicity and traditional American roots. Tattoo artists have to work with a set of rules which will make their tattoos really traditional in order to make the real American Traditional designs. The majority of these rules apply on certain motives and themes and how these could be colored or drawn. Traditional artists are using the work of respected and well-known pioneers of this style, such as Sailor Jerry Collins, Don Ed Hardy and Lyle Tuttle for their basis. For this reason, a large number of traditional designs are being taken directly or interpreted from the sheets of tattoo designs prepared for mass replication, widely known as “flash”. If you are one of those collectors who would like to get a real and fully “traditional” custom tattoo, you should be aware of the strict guidelines these tattoo designs imply. Therefore, it is wise that you choose a tattoo artist that is familiar with these guidelines and can give you the traditional tattoo with a twist of yourself or the artist. 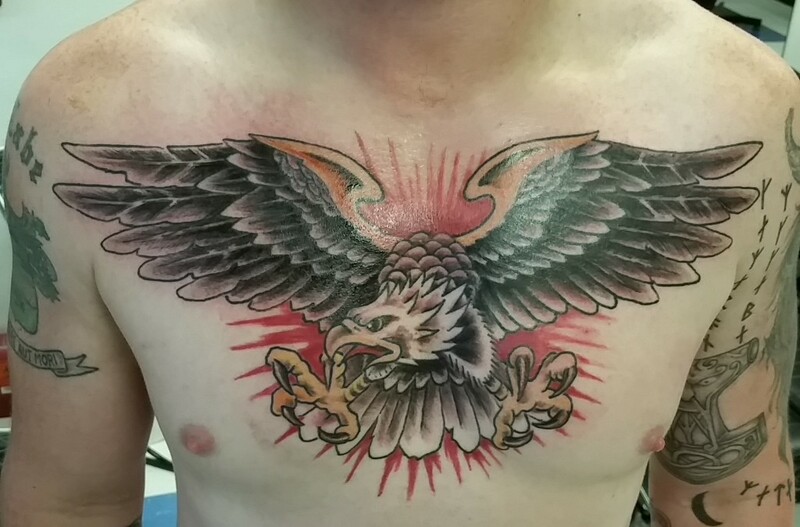 If the artist does not pay heed about this aspect of American Traditional tattoo design styles, a person may end up with a “knock off” or “untrue” traditional tattoo, which will be discerned by all the people knowledgeable in the art of tattooing. Of course, this may not be as important to some. Neo-traditional is one of the newer aspects of traditional tattoo designs. It is a design that has become more popular in the past few years. This design is made by combining the rules of traditional tattoos with some modern techniques and tools. Usually, this results in an original yet advanced tattoo. For example, a tattoo performed in a neo-traditional style, may still have simplified shapes and fat black outlines and characteristic for the traditional practice, while also introducing a much broader color palette and some unusual, modern theme or motive. Neo-traditional tattoo design styles are great for those who like the traditional designs but would like something more original. This is just a few of the facts about Traditional American tattoos. Tattoo Consortium can design Traditional American tattoos to any of our clients specifications. For more information or to get started on your next tattoo contact us with the link below!